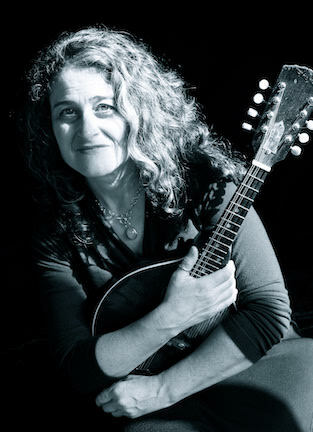 Marla Fibish is one of the prominent voices of the mandolin in Irish music. She brings a deep and distinctive sensibility to the tradition on one of its lesser-heard instruments. Her dynamic playing is featured on the 2017 Noctambule release A Sweetish Tune, on the eponymous Three Mile Stone recording with San Francisco favorites, fiddler Erin Shrader and guitarist Richard Mandel, and on The Morning Star, a duo CD with legendary Irish singer and bouzouki player Jimmy Crowley released in 2011 — an all instrumental project that features Irish music on an array of mandolin-family instruments: mandolin, mandola, mandocello, bouzouki, and dordan. She has performed and taught nationally and in Ireland, and was a featured performer at the 2018 Masters of Tradition festival in Bantry, Co. Cork. Marla also plays mandola, tenor guitar and button accordion, and is a singer and a composer. She is known for her musical settings of works from a variety of poets, as well as original tunes written in traditional forms. This work is featured in the duo Noctambule, her longtime collaboration with guitarist and husband Bruce Victor. Their earlier releases include Travel in the Shadows in 2013 and The Waking in 2015.